Every year at Thanksgiving I get a bit emotional. I have so much to be thankful for year round, but it’s easiest to remember it when everyone else is talking about gratitude too. As a mom, I want to make sure that my son grows up appreciating all that he has too. Earlier in the week—after the teeth-brushing and pottying, before the story reading, right at the beginning of cuddle time—I suggested to my son that we share with each other the things that we are grateful for. Of course, like any good almost-five-year-old, he asked me what exactly grateful is. I told him it’s a feeling of thankfulness, gladness, a warm or happy feeling you have because of something that you have in your life. 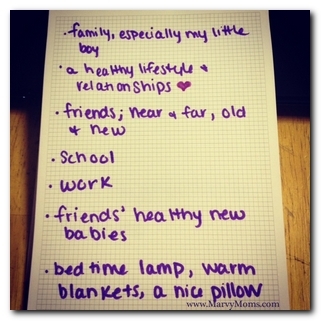 We started out with just three things that first night, and took turns naming the things that we’re each grateful for. We’ve graduated to more things, just talking until it seems like we’re done for the night. My list. Since we’re talking at bedtime, some of them are bedtime-themed of course. 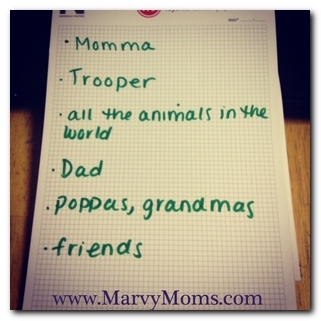 My son’s list. His favorite people, his favorite dog. It’s definitely safe to say chicken fingers belong here too. I wrote them down so I could visualize them, but that’s not even necessary. This was a really easy change to bed-time, and it felt awesome to do together. I went to bed happy and calm, and I think my son did too. It also occurs to me, this is a great way to make spirituality real without being too heavy for comprehension. This is officially my third favorite part of bedtime, only after the smooches and I-love-yous.